Some good things must always come to an end. Last weekend the University of Miami volleyball team suffered its first loss of the season. As odd as it is to say, it is a good thing, in disguise, that this squad got a loss out of its system as they will now be even hungrier to succeed. If you have just been reading my recap articles every week just to see how the team is doing, thank you; at least I have a fan base out there besides my parents. I do have to say, though, that it is one thing to read about what is going on but it is another thing to actually see it. Go out to the Knight Sports Complex and see the energy and passion these girls play with. This is a team filled with veterans and two promising young freshmen. The Canes volleyball team is in similar territory, as they were slated, before the season, to finish ninth out of 12 teams in the ACC. Last year the team won 14 games overall. This year the team has already won 13 of its first 14 matches! The exciting thing about this team is that this is a squad that knows how to finish at the end of games. The team knows how to execute; they are 5-1 in crucial fourth sets and 1-0 in deciding fifth sets. Eighth-year head coach Nicole Lantagne Welch is pressing all the right buttons and has the team poised for a late season run. Despite this, this Hurricane volleyball beat writer has a couple of humble suggestions to offer up to the coach. It is very key that freshman phenom Lane Carico continues to start. She leads the team with seven double-doubles and is a blossoming before our very eyes. Her hustle and determination are uncanny for a freshman, and she has the most powerful kills on the team. She and Genny Mayhew make a dynamic one-two punch at the outside hitter position. The second piece of advice is to continue to let the serving specialist – Maria Andersson – serve. The Swede has a sweet service swing and has 13 aces despite only starting in three games, which is good for fourth highest on the team. The final bit wisdom I offer is to allow Lici McGee to continue to provide a spark off the bench. Her timing in the front court is remarkable, and she leads the team in blocks with 1.28 per game despite the fact that she comes off the bench the majority of the time. 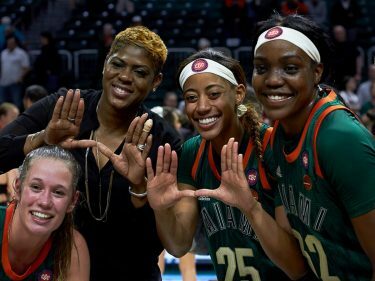 McGee redshirted last year and definitely was taking notes while watching 6’5″ Ciara Michel, who has the most blocks in UM volleyball history. With all that said, I leave with a few thoughts: This team is good. They are very good. Only the future will tell how this storybook start ends up unfolding. But do know this: the sky is the limit for this team.